Shawn Yue is full of surprises. After a sudden announcement last December that he got hitched to Taiwanese model Sarah Wang, he's now becoming a dad. 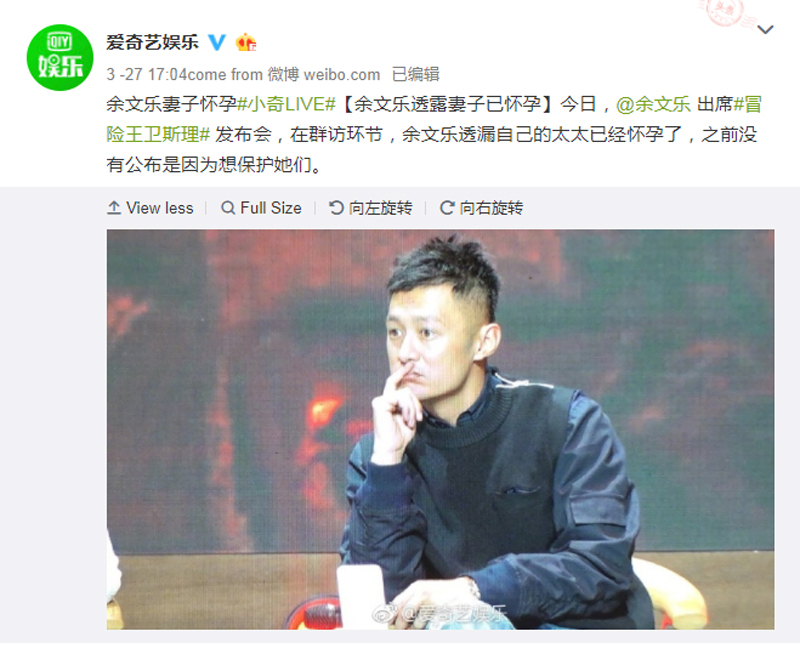 The 36-year-old Hong Kong actor confirmed on Tuesday (March 27) at a press conference for iQiyi's sci-fi web series The Great Adventurer Wesley - Fragment Man, that his wife is expecting. He kept the pregnancy under wraps to protect his family, Apple Daily Taiwan reported. But sharp-eyed reporters were quick to spot Wang's baby bump when she was out and about earlier this month. According to Next Magazine, Wang, 29, is six months pregnant and she is due to give birth in June. The mum-to be is now resting at home in Hong Kong to prepare for the baby's arrival. The secret's out so let the congratulations pour in. Hong Kong actor Shawn Yue and his wife Sarah Wang have welcomed a bouncing baby boy. Wang, 29, delivered the 3.2kg baby via Caesarean section in a Hong Kong private hospital on Thursday (May 10) afternoon, Apple Daily reported. In the post, Yue said that he felt indescribable joy when he first saw his child and was grateful that both mother and baby were safe and sound. Hong Kong actor Shawn Yue has tied the knot with Taiwanese model Sarah Wang after a year of courtship. On Tuesday afternoon (Dec 5), the 36-year-old announced his surprise marriage via social media. In the post, he said that he was grateful to have met the right person at the right time. He added that Wang filled his life with positivity and happiness and promised to bring her happiness. The couple exchanged their vows in a private ceremony attended by family and friends in Melbourne, Apple Daily Taiwan reported. Following the announcement, congratulatory messages poured in on social media, with fans wishing the newlyweds a lifetime of domestic bliss. Yue is best known for his role in crime-thriller Infernal Affairs and its sequel. They first met when Yue was in Taiwan for the filming of Love off the Cuff, Hong Kong media reported. His 29-year-old bride is the heiress of a leather goods company in Taiwan.